The Time To Invest … Is Now . We can help administer the Youth Risk Behavior Survey for students in grades 9-12, to find out where prevention efforts should be focused. The Teen Assessment Project (TAP) survey for students in grades 6-8 helps identify behaviors and substances to address in middle schools. We encourage districts to explore more supportive, less punitive policies and procedures for drug and alcohol related issues. We support creating early interventions, brief assessments, and referrals to services as each interaction may be a critical point of intervention. *If there is a topic you would like to see, just ask. Workshops outline what parents can expect in the new year, how to better provide extra support, and how to identify possible use and spot red flags. Everyone plays an essential role in preventing use and abuse. Many communities don't think they have a problem, while others have prevention already happening. We use the 5-step Strategic Prevention Framework (SPF) . Step 1 - Conduct a Community Assessment to determine its level of readiness to take action; identify assets, strengths, gaps, substances to address, resources and other efforts currently happening (to reduce duplication). Step 2 - Build Social Capacity and secure resources to move forward with prevention plan development and implementation. Modify & Changing Policies — Update policies to be less punitive and more supportive; for example less out of school suspension time, making up missed work, making referrals, providing recovery supports in the school or workplace, or financial incentives for quitting smoking. Step 4 - Implement the plan noting benchmarks and challenges. Step 5 - Evaluate the plan annually to measure how its working, areas of success and needed changes, then update to address newly identified priorities. Plans Are Both . . .
1. Sustainable — prevention activities are built into school and business budgets to ensure long-term sustainability. 2. Cultural Competent — strategies must be culturally appropriate for the school or community they take place in. Want to help? Become a Certified Prevention Specialist . . .
Register for training here:: NH Training Institute on Addictive Disorders . 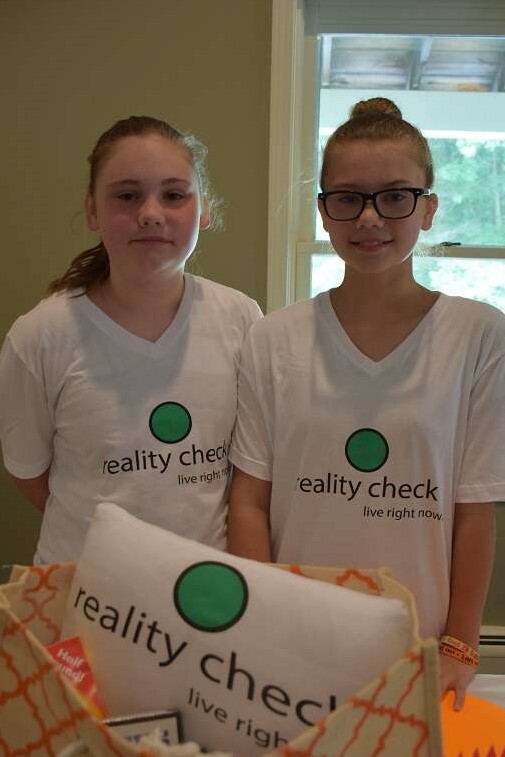 *Reality Check will help pay for training to get certified. Trying to talk to kids about alcohol? Why can't I take other people's meds? Opioids ~ can cause choking, slowed breathing, paranoia, fever, abnormal heartbeat, seizures, coma, or death. Addiction ~ Once you become dependent on a drug, you need more of it to get the same effect. Quitting can cause nausea, shaking, sweating, insomnia, vomiting, depression, exhaustion, and life-threatening issues. • Accidents ~ Driving while drugged could get you in an accident, and if you get stopped you could face severe penalties. • Failing Grades ~ While some students take medication to do better in school - don't, you can become addicted. • Legal trouble ~ Taking medication that isn’t yours - is illegal. Chances of committing a crime go up when you’re high - and if you’re caught, you can face suspension, fines, jail time. Our very own Ella and Joanna Burt volunteering at the Drug Epidemic Response Forum! Talk with your kids about the risks of using alcohol, illegal drugs, and medicine not prescribed to them. Set consequences for breaking rules. If they break rules, enforce them! medicine not prescribed to them. Be involved ~ Go to after-school activities, have dinner together, and meet your kids teachers. When your kids aren’t home, make sure you know where they are and who they’re with. and anxiety. Get help by asking your school nurse and family doctor. Be a good role model. Kids who see parents abusing drugs or medications are more likely to develop problems. Manage stress by exercising, talking to a friend or therapist, watching something funny, or playing a game. Catalog of Exemplary and Promising, Safe, Disciplined and Drug-Free Schools Programs. Preventing drug use and abuse among youth, teens, and young adults.